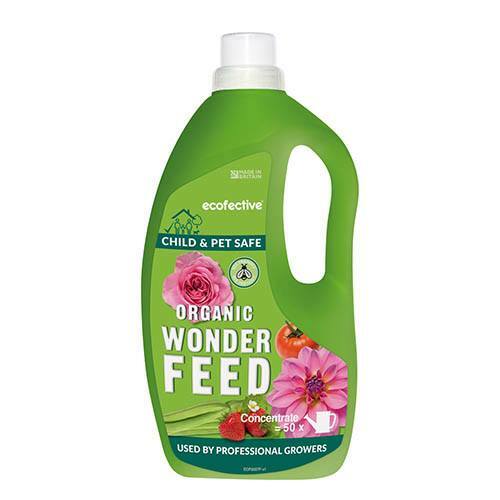 Child, pet and bee safe, ecofective Organic Wonder Feed is a high quality natural based feed, with the added bonus of DELTA+, which contains bio-stimulants which increases nutrient uptake by the plant. A universal feed for both indoor and outdoor plants, this formula is perfect to use under cover to include pepper, chilli and herb plants. It makes up to 50 watering cans and promotes strong, healthy fruit and vegetables and encourages abundant, vibrant flowers. The natural based ingredients mean it is safe to use around children, pets and beneficial insects including bees. Proven to be highly effective, the same formulation is currently used by many professional growers and landscapers across the UK and Europe. Bees are essential within nature and protecting them is becoming increasingly important. Wonder Feed is completely safe to use around bees, it will not harm them. You can select a number of flowers to encourage bees including tulips, sunflowers, French pansies, flowering fruit and vegetables like green beans and strawberries. Supplied as a 1.5L bottle of concentrate, enough to manke up 50 watering cans.